A pedal that combines fuss-free performance with confidence-inducing durability. This recent addition to the Dunlop effects range revamps the basic volume pedal by making use of some clever thinking and similarly smart styling. The latter concerns a beefy but smooth casing in space-age brush-finished aluminium, with chunky looks matched by measurements that easily accommodate a size 10 boot. An accordingly long treadle section is topped with a tyre-like, heavy patterned rubber insert that gives you some serious grip underfoot. The pedal's substantial weight helps keep it firmly in place, with further anchorage provided by the rubber-covered baseplate. Volume changes are made using a conventional passive pot, but the partner treadle mechanism employs Dunlop's new Steel Band Drive, designed for minimum maintenance and friction-free performance. A rear-mounted tension screw adjusts sweep action stiffness, while all connections are at the opposite end of the case, comprising input and output jacks plus an independent tuner feed. The well-chosen components ensure that there's no noticeable signal degradation, while appropriate level amendments are smoothly progressive from off to the full-on position. 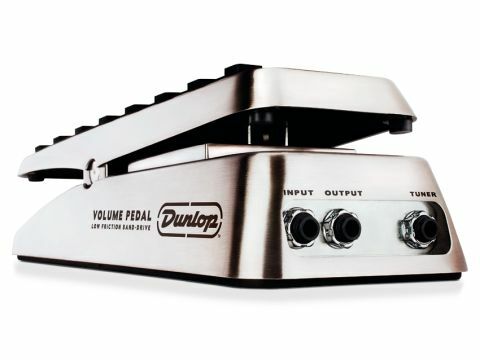 Dunlop's DVP1 is an obvious competitor to the BOSS FV-500H, but lacks the latter's minimum volume facility. Despite this deficit, it's a viable alternative, although the asking price could be considered quite steep for such a simple pedal.